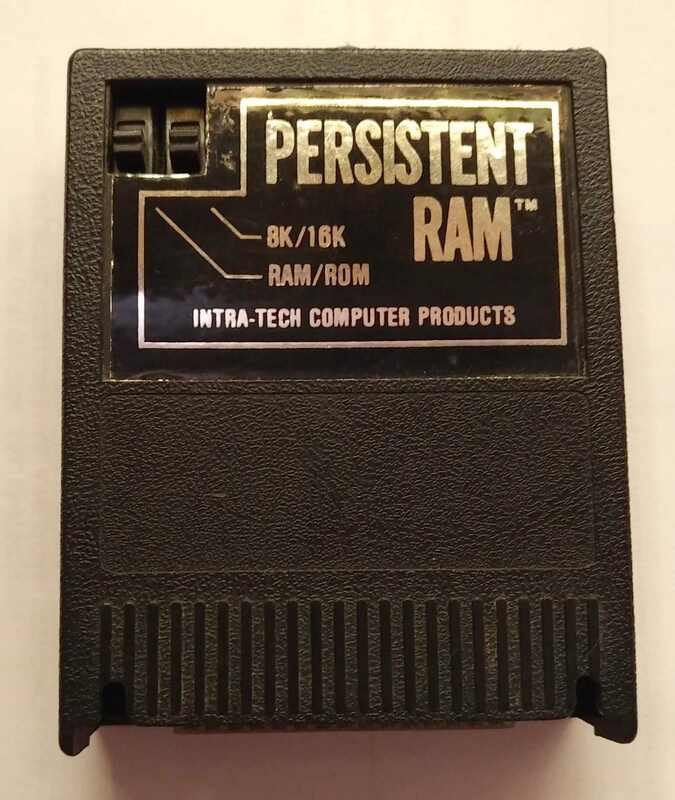 I have a gem here readers may be interested in - The "Persistent RAM" cartridge by Intra-Tech Computer Products. There appears to be literally no information about it online. Only a single entry on AtariMania with a picture and no other information. Probably considered 'Rarity 10'. 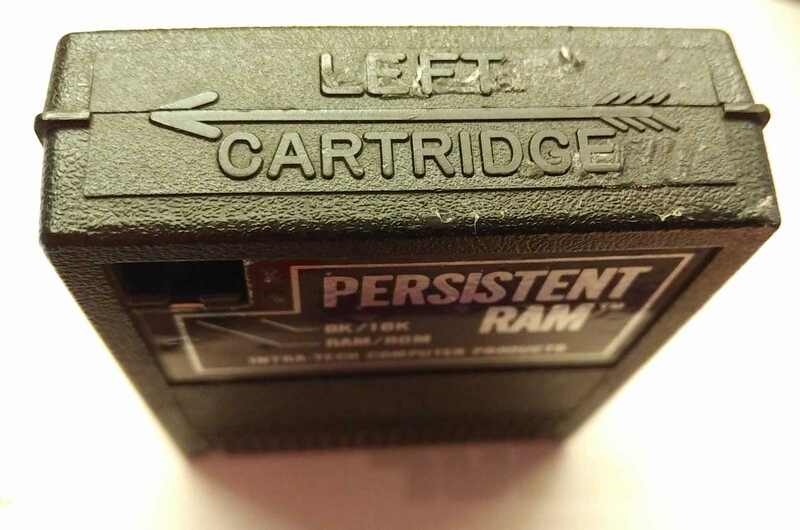 There is only two mentions of it on all of the AtariAge forums, in cart lists with no information, and 'no ROM dump' - which I thought was funny (since it's RAM). It operates passively in the "RAM" mode, and you can load up any standard cartridge based code into the 8K or 16K address space, and flipping the switch to the "ROM" position 'locks it in' to static battery-backed RAM and then operates as an 8K or 16K ROM cartridge. IE - Load the 8K Track & Field, or 16K Pitfall II, flip it to ROM, and when you turn the computer off, and back on again, and instantly you're back in the game as if it is a real ROM cart. I can see this would have been invaluable for a software developer working on a cartridge title! As long as there is a valid Cart init/entry point intact, it would work. Most XEX games that originated from Cart dumps that leave the original code in the $A000-$BFFF (8K) or $8000-$BFFF (16K) range should work. XEX loaders often have extra initialization code placed elsewhere in RAM, that obviously gets discarded. I used this as a kid to load games off of tape or disk, and then keep it as a 'virtual cartridge' for instant load the next time. It was neat to be able to change up which 1 game was on it. The original battery was a 3V lithium cell soldered directly to the PCB, but I replaced it with a ginormous CR123A battery ages ago and attached it externally with hot glue which was long since dead. I just replaced it with a new CR2032 cell holder recently after ordering 4 different types to see what would fit inside the cart shell, since I really didn't want to solder a battery directly to the PCB, which I think was the original configuration... well I got one to fit, and confirmed it still works! The PCB appears to consists of just 2 8K SRAM chips, and some simple logic chips, a diode to protect against reverse battery polarity, and a capacitor. 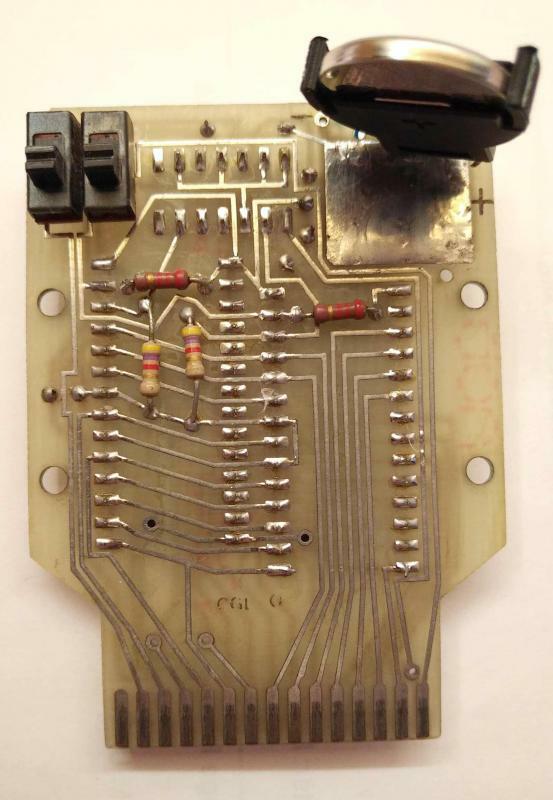 The solder work was originally really messy, and looked like a lot of old (acid based?) flux was left, indicating quick work. I spent an evening cleaning it all up with isopropyl alcohol, and reflowing solder. After first replacing the battery, I did have some strange issues with the computer not booting up occasionally, but that all seems to have cleared up after time, maybe from corrupt RAM in the cartridge memory space. I've taken some pictures of the internals as well, lifting up my battery holder so all of the PCB is visible. My dad who acquired it originally back in the day thinks it was created by a local hardware guru in the Vancouver, BC (Canada) area he knew, but pretty hard to confirm nowadays... may be the same guy that created clone Happy PCB's he had some of, one of which I still have. Maybe someone with experience in PCB design would be interested in replicating it. Maybe others would be interested in acquiring those replicas. Looks like only a few pretty cheap components. Curious to hear if anyone else out there knows any additional history about this cart, and thoughts on it's workings / design! Thanks for sharing, and the pics. It's listed on Pitfall Jones' site, and you can see a picture by click the link for it. be information there or not. OK, one more bit of information here: AA member AtariGeezer mentions having one. Maybe he has some info to share about it. Edited by MrFish, Mon Jan 21, 2019 1:11 AM. Interesting read! I never knew about this one. More complicated, but the pictures don't look like that much more component wise. But for a fun 8K or 16K novelty... 2x6264 static rams, 74LS04N, 2 switches, and a 3V lithium cell are pretty cheap common components available today. The S/XEGS RAMCART 128KB looks like a fun project, although it isn't as highly specced as alternatives such as The Cart!. etc., it had a build cost of 8 euros at the time, so I wonder what it would cost now to produce? 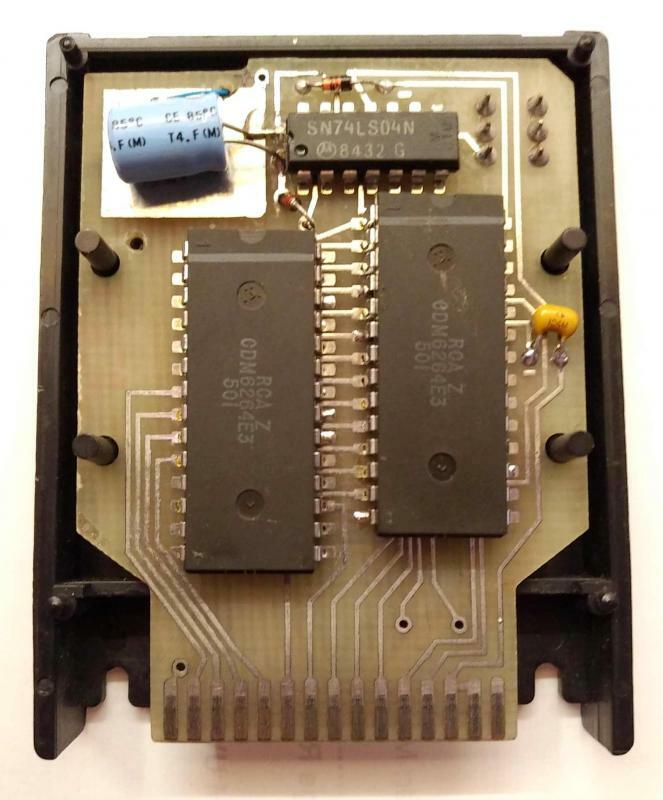 Could the S/XEGS Ramcart 128KB be used to hold a version of SpartaDOS X, and would it be difficult to up the memory to say, 256KB, and have the cartridge act as a writable disk/file system which also holds SpartaDOS X?